Cahnman's Musings: How will Tom Herman hire impact U.T./Houston dynamic in the 85th #TXLEGE?!? How will Tom Herman hire impact U.T./Houston dynamic in the 85th #TXLEGE?!? 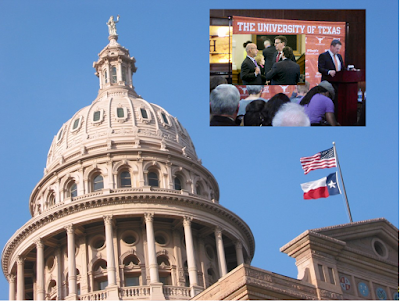 Last Sunday, while attending Tom Herman's introductory press conference as the new Longhorn Football Coach, we had a thought: considering that the legislature is already livid with U.T. for their activities in Houston, how's poaching U of H's football coach going to go over?!? For those who don't remember: Last fall the U.T. system, at the behest of Chancellor McRaven, announced plans to expand into Houston. As we predicted at the time, this set off a gigantic turf war between U.T. and U of H. As Senator John Whitmire said exactly one year ago today: "In all candor, in my 42 years of service in the Texas Legislature, I have not seen such and affront to the legislative process and the conservative deliberations of the higher education community." To which U.T. responds by poaching U of H's Football coach. "It's disappointing that the University of Texas -- who wants to open a campus in Houston and said they would never do anything to harm the University of Houston, with all the football coaches in America, who said that they would stand up for us to get into the Big 12 and then didn't even vote for us when they met with the commissioner and all the schools -- had to come take our little football coach,"
OUCH...and we hadn't even thought about Big-12 expansion. Bottom Line: If, in addition to restoring Longhorn Football, the Tom Herman hire also inspires the legislature to crack down the UT politburo's various other shenanigans, it could be one of the greatest two for the price of one deals of all time.